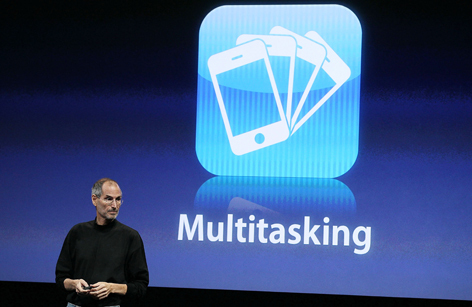 Apple says its implementation of multitasking in iPhone OS 4.0 is going to be the “best” on the market. Double-tapping the home button brings up a “dock” that shows icons for each currently-active application. Tapping on an icon switches the phone to the selected app. However, this is not the kind of “real” multitasking found on Windows Mobile, Android, or Palm WebOS phones, which let full applications switch into the background, just like your desktop PC. Nor is it like the current iPhone OS, which completely shuts down apps (except Apple’s own Mail, iPod, and Safari apps) upon returning to the home screen (some apps save some data upon exit to be able to return to where the user was, but most don’t). Instead, iPhone OS 4.0 borrows a page from Microsoft’s upcoming Windows Phone 7 OS and can “suspend” certain applications in their current state when the user switches to something else. Then when the user switches back to the app, it can be restored to the foreground exactly as it was before. What makes Apple’s system worthy of being called “multitasking” is that it allows apps that are about to be suspended to request up to 5 minutes of time to continue running as-is. Apple claims that its implementation of multitasking avoids the pitfalls of “real” multitasking- namely that running background apps causes higher power consumption and negatively affects the performance of the foreground application. We doubt the OS can completely alleviate these (after all, it will still be running extra services in the background, even if not full apps, so it’ll have to use additional CPU power), but it will indeed probably save a bit of battery life. The vast majority of iPhone users have been living happily for years without any form of multitasking for third-party apps, so iPhone OS 4.0 will definitely be an upgrade. 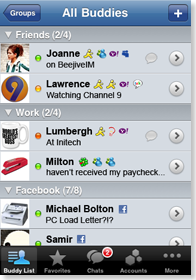 Unlike Windows Mobile, Android, or WebOS, which provide task managers to let users manually close applications, the iPhone implementation has no such feature, preferring to manage app closing only by itself. We see some issues in Apple’s approach– primarily that some types of applications, like instant messaging (IM / IRC) clients, will not be supported for background usage. IM apps require little more than a constant network connection, which the OS’ background VoIP services can provide, but IM apps likely won’t fit into that category in the app store. Apple probably can’t provide this kind of multitasking UI because unlike “real” multitasking systems, full apps aren’t actually running in the background in iPhone OS 4.0 (so what would it show a screenshot from?). Unfortunately, iPhone OS 4.0 continues an Apple tradition of artificially restricting features on its older devices in order to promote new hardware upgrades. 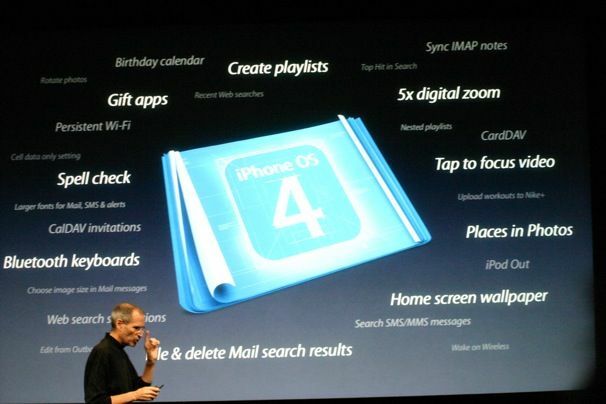 OS 4.0 will not enable multitasking on any device released before the iPhone 3GS and the latest iPod touch. This is unfortunate because even the first-generation iPhone is completely capable of “real” multitasking (through jailbreaking), so it would definitely have no problem with OS 4.0’s “lighter” implementation. However, this is nothing new– when Apple released iPhone OS 3.0, it finally added MMS (picture messaging) support for 3G and 3GS iPhones, but not the original one, citing technical reasons (when in fact jailbroken apps could provide full MMS support on the 2G model). Similarly, Apple added A2DP Stereo Bluetooth support (for wireless headphones) but left out the iPhone 2G, saying its Bluetooth chipset lacked the necessary features. 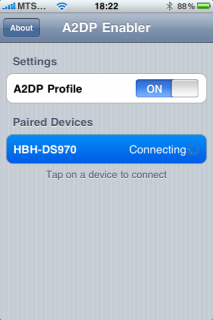 This, too, was false, and a simple patch can enable A2DP in 2G iPhones.